We are located on the Arizona side of the beautiful Colorado River, 7 1/2 miles north of Parker, off Highway 95 north, exit Golf Course Drive. Our resort has an abundance of citrus trees, large shade trees, and green grass. 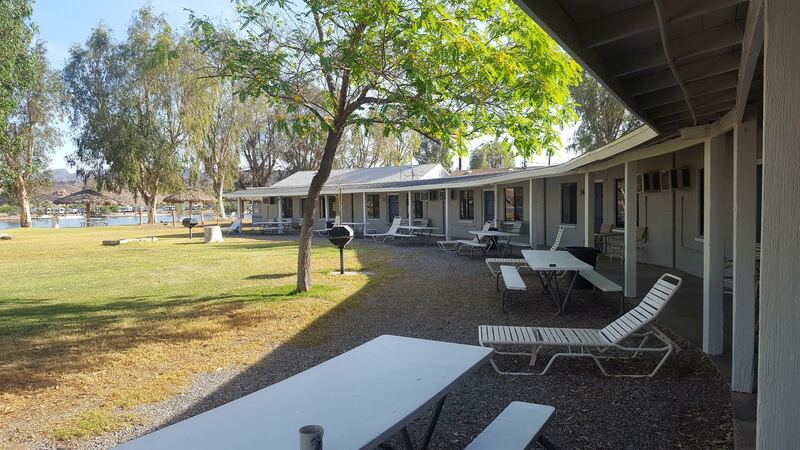 Its 17 acres are divided into a mobile home park, RV park, motel units with electric kitchens and microwaves, boat launch ramp, boat slips, horseshoe pits and a complete volleyball court. In addition, there is a recreation hall and a universal fitness center. The Emerald Canyon Golf Course, which is adjacent to Branson's Resort, has been rated one of the best 18 hole golf courses in Arizona by the Arizona Golf Association. Popular activities at Branson's include swimming, water skiing, sunbathing, and fishing for Bass (both striped and largemouth), Catfish, Crappie, Blue Gill, and Trout. Off-road recreation is second to none here in Parker AZ, whether you drive a UTV, Motorcycle, Jeep, or any other off-road machines, there are endless places to explore. Card games, crafts, quilting, and potlucks are available in the winter months to fill the days of the most avid activity seeker and the spectacular scenery creates a Mecca for the photographer. So bring your appetite for enjoyment and we will furnish the setting for a memorable vacation. From motel rooms, mobile homes, to RV spaces, we have something for everyone! Book today for an amazing stay in the center of the Parker Strip!